Sword Hangers, wall display plaques and tabletop stands for sale offer a unique way to display swords, daggers and replicas. The displays and plaques are made of wood or metal. There are designs that coordinate with Japanese, medieval, Western and pirate themes. Use these sword hangers, wall plaques and mounts to show off all of your blades and collectibles. Celtic Wall Hangers for sale offer a distinctive and stunning way to display swords, daggers and western replicas. Each display measures 3 3/8th inches. The set of two can be positioned any distance apart. The displays are expandable which makes it possible to display various sized swords and collectibles. 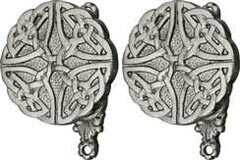 The Medieval Celtic Wall Hangers are meticulously cast of metal and have an antiqued finish. These displays also include the necessary hardware to hang them on the wall. Buy these medieval style Celtic Wall Hangers to display your swords and collectibles for only $12.99.